A good friend of mine has just started actively selling handmade items in her Etsy shop. Sarah and I have known each other since we were about two years old. You could say we go back a ways. She is an elementary education teacher and loves to read more than anyone I've ever known. Many of her items encourage this love of reading in kids. To help spread the word about her little shop, Story Snuggles, we're doing a giveaway! This giveaway is for an item of your choice from her shop. This is just in time for Christmas since we are all running out of time to make those final gifts. The giveaway is only open to US residents. Sarah is frequently adding new items to the shop. Add her shop to your Etsy favorites so you can easily find Story Snuggles in the future. Come back here and leave a second comment that her shop is now in your favorites. To receive 20% off any order from Story Snuggles, use the code THANKS. Place your order by December 15 to have it shipped in time for Christmas (within the US). The giveaway will end Wednesday, December 7 at 8:00 a.m. MT. The winner will be selected by Mr. Random. I liked so many things over at the shop but the Newsboy monkey was too cute to pass up! The Story Snuggle etsy shop is now one of my favorites! Such a cute shop!! I love the growing vegetable soup playset. Allie has that book and I love it! So many lovely things! I've added as my favorite shops. It's hard to decide, but the Cupcake Set is so adorable! Thank you for this sweet giveaway. Love the items in the Esty shop. All cute. 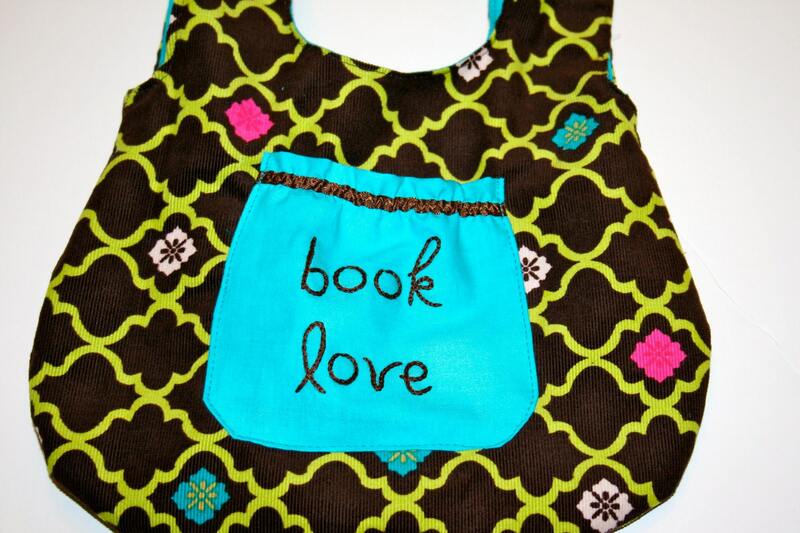 Would love to win the "Read" bag for my book-mad little granddaughter. The turquoise version is great! I added Story Snuggles Etsy shop to my favorites (Shahann@yahoo.com). Thanks for the giveaway right before the holidays! I really like the felt train play set at Story Snuggles Etsy shop. Thanks for the chance to win it. I like the cupcake play set at Story Snuggles Etsy shop. Well, it didn't take me long to find a favorite! I love orange! Thank you for a chance to win a lovely gift! I hearted her shop, but my favorites are private, so she'll only see a ?. I'm still there. Love it! I love the Owl Onsie...my granddaughter would be too cute in that! Oh my gosh, I love that Chicka Chicka Boom Boom playset!!! My munchkin would love playing with something like that. Genius idea!!! My son has been reading Chicka Chicka Boom Boom at preschool this week, so I'd have to go with that play set! I added her shop to my favorites. 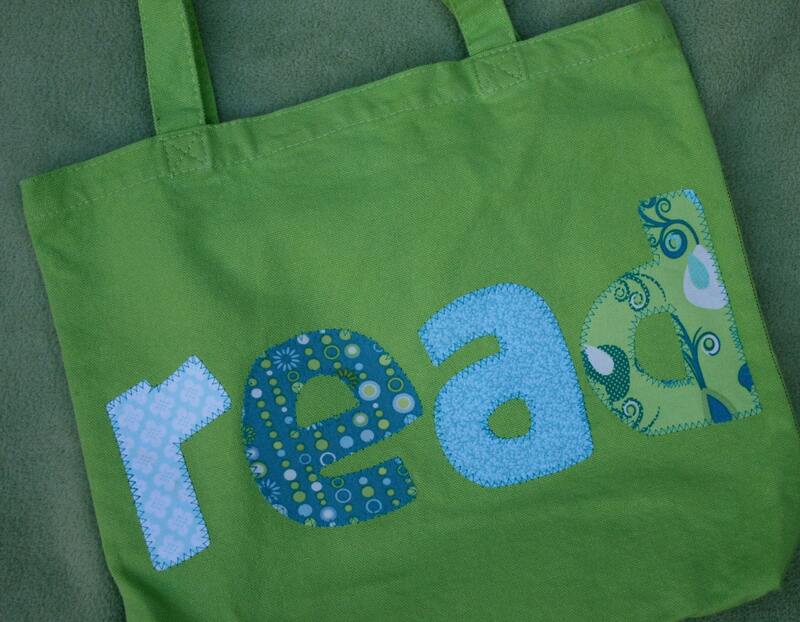 The Read Tote is perfect for trips to the library! um, the i <3 books tote in pink, PLEASE!!! I love the cupcakes...so cute!! Lots of cute stuff the Book Love Clutch is my favorite!! I would choose Read Tote, Aqua and Red for my daughter who is an art teacherand loves books. Story Snuggles Etsy has been added to my favorites. So many cute things! AHH!! I love the Once Upon a Time Pillowcase, the Chicka Chicka Boom Boom Set, and the Born To Read baby gift set.But the Newsboy Monkey has stolen my heart. He is the one I would choose. 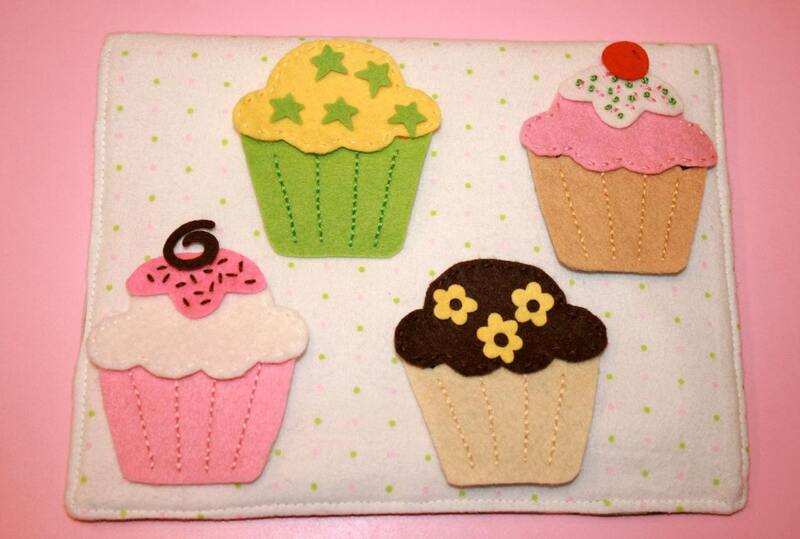 But I am not selfish, so really I would pick Cupcake Felt Set with Pocket for my little one. I had to favorite this shop. HAD TO. Such fun things! My boys are into Chicka Chicka Boom Boom right now, and I would love that felt set! Added her site to my favorites, awesome stuff! Cute things! 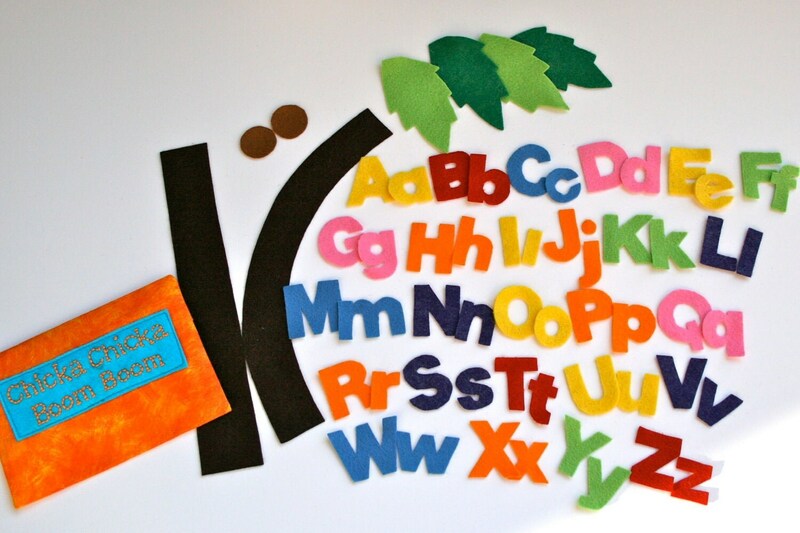 Chicka Chicka Boom Boom Felt Play Set would be choice. Thanks for the great giveaway! The vegetable soup play set is my favorite! I like the color zoo felt playset. I like the vegetable soup playset best. such cute things, especially the playsets. but i really love the man's best friend tote - that's one of my favorite quotes! The cupcake playset or the owl onesie would be my picks. I love the mans best friend book bag. These are all adorable but my two year old would be deliriously happy with theChicka Chicka Boom Boom set! So fun! Oh goodness, this is such a great Etsy shop, as soon as I saw her products I added her to my favorites. I teach preschool and also love to read, I have given my class the love of books too. 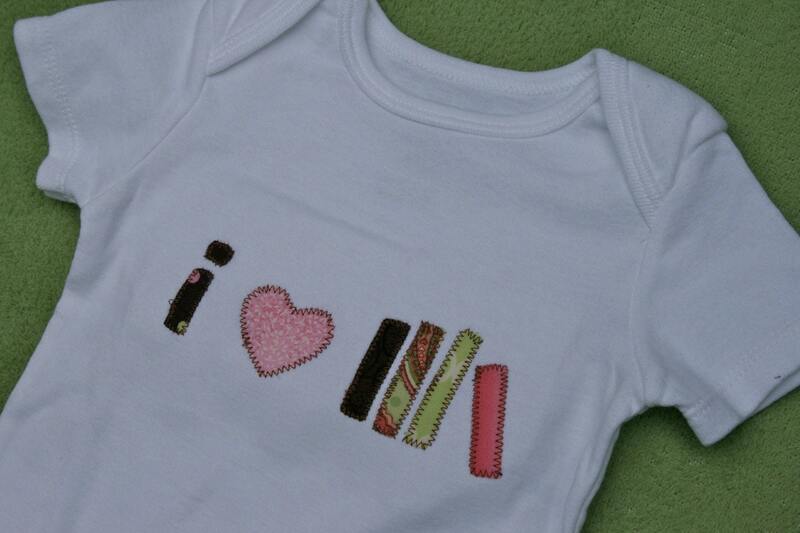 If I had a little one I would love the I heart books shirt, but my favorite has to be the Mouse Paint flannel story! Thanks for the giveaway! Have you seen my giveaway too? What a great Etsy shop! The I love to read onesies with ruffled pants, tooooo cute. Just ordered for my daughter's baby shower (she is a librarian, perfect!). Thanks for showing it to me! loved the chicka chicka boom boom set! Etsy shop is now one of my favorites!! 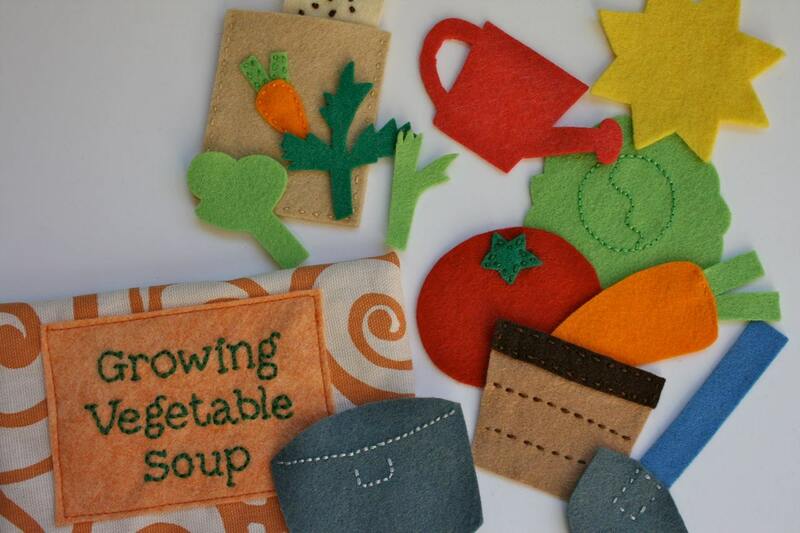 i love the veggie soup play set- let's love veggies little ones! love the born to read onesie! I love the Owls. They are so cute! It all looked so cute but I think my boys would love the Big Green Monster the best! Great stuff, so fun and bright. Come by my blog, I also have a giveaway. It's a vintage garland tutorial and giveaway.